One evening not long ago, I was in the mood for a really great burger. My husband was in the mood for really great fried chicken. We wanted to dine in rather than take out, so we decided to try Cider Mill Restaurant and Lounge/Fryer Tuck Chicken at 6712 S.W. Capitol Highway. At first, we were a bit apprehensive. Was it more of a bar than a restaurant? Would we end up sitting at a counter? Fortunately, as soon as we walked in, we were approached by a friendly waitress who led us to a cozy corner table, so that solved that. Still a little unsure if this was the right place for us, however, we glanced over the menu and made up our minds. We would try what we had come for: a burger and fried chicken. We had had some prior experience with the food at least, in that my cousins swear by the restaurant's "Little John Spuds" and often pick up an order along with the famed dill dip and bring it all to our family potlucks. I ordered the Mill Burger, and my husband had the four-piece fried chicken. He ordered his with spuds and I had the homemade chips. 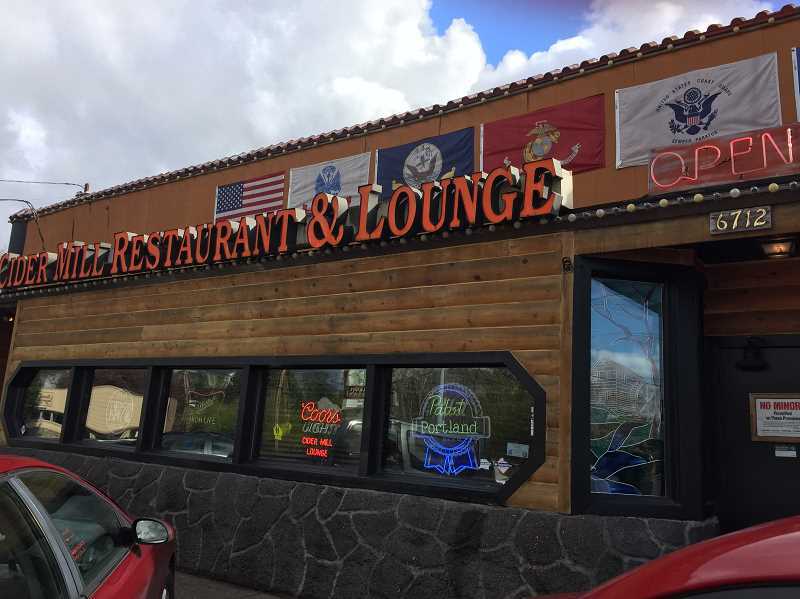 While we enjoyed a beer and waited for our food — which didn't take long — we gazed around at photos and paraphernalia displayed on the walls, most of which was U.S. Marines memorabilia. All the while, we were serenaded by Jimi Hendrix and the like, emanating from the jukebox. When the food came, we were astounded by the portions: enormous, in a word. My burger turned out to be everything I'd hoped for: perfectly cooked, juicy and delicious. And the chips? I thought I'd died and gone to heaven. My husband and I swapped bites and we both agreed we had never had better fried chicken. The spuds that we'd tried at the aforementioned potlucks were even better fresh and hot. And the dill dip? Well, the dill dip is the stuff of legends. Without being the least bit pejorative, I'd say that the Cider Mill Lounge is a classic dive bar. In the same location since the 1920s, it's definitely a taste of old Portland, something that seems to be harder and harder to come by. I spoke to the bartender, a charming lady named Mercedes, for a while and she said that most people who work for owner Toby Harris tend to stay on a good long time. She herself has been bartending there for four years, and pretty much knows everyone who walks in the door. Harris, a dyed-in-the-wool neighborhood local, bought the place from Ed and Peggy Erickson in 2009, who themselves had owned it since 1988. Apparently not much has changed in all those years, though I understand a few renovations were done by Harris. These days, guests can warm up at the firepit outside, socialize on Thursdays' trivia nights, have fun with Friday karaoke, or enjoy bands on Saturday evenings. Performers for each weekend are listed on the website, Fryertuckpdx.com, or on the sign board outside. Alternatively, you can just hang out and watch the game on one of the bar's TVs, or plan an event in the large dining room. No one under 21 is allowed in the lounge, but if you've got kids or only want take out, you can order from the Fryer Tuck counter. (The menu and phone number is on the website.) Besides the chicken, spuds and burgers, Fryer Tuck offers hot and cold sandwiches, soups, salads, pizza and appetizers. In short, Cider Mill Restaurant and Lounge/Fryer Tuck is nothing more than what it claims to be, and that is quite enough. I may not be much of a lounge lizard, but this place is definitely on my list for authentic and delicious Portland experiences.